Frank Klees is running for the leadership of the PC Party of Ontario and took some time to chat with me today about what his bid means and where Ontario needs to go given the tough economic times and new taxation structure being implemented by Liberal Premier Dalton McGuinty. Frank also discusses specific policy measures that he would or would not implement. Christine Elliott also announced her intention to run for PC Party leader of Ontario. I sat down with Elliott via video conference (Ottawa-Toronto) to chat about the race, her policies and her bid for the job. Today, I had the opportunity to interview Tim Hudak who announced that he’ll be running for leadership of the Ontario PC Party. I’ve just learned that the government will be tabling legislation in the Senate to scrap the long-gun registry.? Current legislation is already on the order paper in the House of Commons, introduced by Conservative MP Gerry Breitkreuz as a private members bill (C-301) whereas the legislation in the Senate is a government bill. Private members bills usually have a tougher time reaching the stage of Royal Assent and thus government legislation will be given a higher priority and indicates that the government is interested in moving to eliminate the long-gun registry as soon as possible. The bill is being introduced in the Senate and was initiated by Public Safety minister Peter van Loan.? It is being introduced in the Senate due to parliamentary procedure which limits redundant legislation from being concurrently considered by the same Parliamentary body.? I’ve learned that the government is moving to fast-track the scrapping of the long-gun registry putting the legislation on the government’s agenda. The scrapping of the long-gun registry would fulfill an election promise for the Conservative Party of Canada that goes back to 2004 when Stephen Harper ran for leadership of the party promising accomplish this. The bill is expected to receive majority support in the House of Commons when it is moved from the upper chamber to the House of Commons for its consideration. UPDATE: A link to the legislation is now available. UPDATE: In a fundraiser speech last night, Liberal leader Michael Ignatieff indicated that he would whip his Liberal senators (sober second thought, indeed) to vote against the legislation so that it wouldn’t even make it to the House for Canada’s elected representatives to consider. Expect the PM to make his case against the appointed Senate and for Ignatieff to lose any perceived ‘gains’ out west. Ladies and gentlemen, the Liberal Party of Toronto. Prime Minister Stephen Harper is expected to announce 18 appointments to the Senate today.? A lot of the Ottawa-based media is either on break or anticipating to knock off for a few days for the Christmas holiday.? However, for those that are compelled to pay attention, a list of the appointments is expected around noon today before the Prime Minister flies off to Calgary for an event this afternoon.? Further, the Prime Minister’s press office was telling a few reporters last week that they expect the appointments to be made today. This represents an unfortunate departure from the principle of an elected senate to make way for the growing urgency and practical necessity of addressing the uncertain balance of power within parliament – one that is within the Prime Minister’s constitutional right to address (or at least his right to make suggested picks to the Governor General).? Many Ottawa observers will note that the Prime Minister has held off on this decision until the 11th hour, until necessary pragmatism eclipsed principle on the issue of the unelected senate.? While the senate remains in its current form, the Prime Minister is making a defensive move to prevent an unelected coalition government from appointing 18 senators whenever they have the opportunity to flip the government by their procedural whim. Some believe that the Prime Minister will make a bi-partisan pick for the Senate, or make a move to reach across the aisle to appoint someone who is non-traditionally aligned like David Suzuki.? I don’t believe that this will happen.? Though Paul Martin appointed Conservative senator Hugh Segal, the majority balance of the senate was not in question at the time or in the near future.? Further, because of the urgency of these appointments, some breathing room is expected for the Prime Minister and gallery barbs will be focused on the size and timing of this set of senate appointments. One province where the PMO has not sought outside advice has been Ontario.? PMO appointments zipped up Ontario early and did not seek additional advice or vetting on picks for that province.? Everyone expects Irving Gerstein to get one of the two senate nods in Ontario. My pick for Saskatchewan is Elwin Hermanson, the founder of the Saskatchewan Party.? However, informed speculation suggests that Barry Firby could be on the PM’s short list.? Firby is the Conservative Party’s regional organizer in that province. New names that I’m hearing for Quebec include Patrick Brazeau and Myriam Taschereau.? Brazeau is the chief of the Congress of Aboriginal Peoples and Taschereau was a candidate for the Conservatives in Quebec City during the last election.? Brazeau would represent a non-partisan but ideologically-aligned pick for Prime Minister Harper. The Conservatives have launched their second barrage of ads this morning along the “Stephane Dion is not a leader” line. This time, the Tories are focusing on Dion and the Senate and the obstructionist tactics that the Conservatives alledge the Liberals are using there. NotALeader.ca was also launched today by the Conservatives and it features the blog of Kyoto the dog. Kyoto’s site is sure to be one of best Liberal blogs. The site also features the ads that were released today. On the main Conservative.ca website, e-cards are featured and you can send your friends a flash animation of the Dion’s Senate tactics. The ads have been launched to mark the dubious one year anniversary of Senate bill S-4, a bill to reduce the terms of senators to 8 years. Conservatives, in the ads point out that senators can serve up to 45 years (until the age of 75). Stephane Dion is on the record supporting limited Senate terms, however, he has been unable to get the bill passed by his own senators for one year now. Is Dion ineffective, or does he really favour the status quo. Canadians have been interested in democratic reform, not the status quo and they’ve been interested in change for quite some time. The Liberals are obstructing legislation in the unelected, unaccountable Upper Chamber. Are the Liberals more interested in protecting entitlements instead of respecting the desire for reform? Senator-elect to serve in the Senate! I was in question period yesterday to see a bit of Canadian history unfold. Mr. Speaker, as part of our campaign promise for democratic reform, our Conservative government put forward Bill C-43, which establishes the national process for consulting Canadians on their preferences for Senate appointment through election. We have recently learned that Senator Dan Hays, who holds the seat from Alberta, will be retiring from the Senate after it rises for the summer. Could our Prime Minister advise the House, Canadians and Albertans on how he will be filling this vacancy? Right Hon. Stephen Harper (Prime Minister, CPC): First, Mr. Speaker, let me take the opportunity to congratulate Senator Hays on his long public service, including his role as leader of the opposition and Speaker of the Senate. We do have Bill C-43 tabled. On the other hand, the province of Alberta did some time ago hold a popular consultation for the filling of a Senate vacancy. When that seat comes due, I will recommend to the Governor General the appointment of Mr. Bert Brown. This is fantastic news for western populists who have been championing senate reform for the past 20 years. The resignation of Hays has allowed Harper to accelerate the appointment of an elected senator and to realize an old Reform Party ideal. Once the process of appointing senators becomes normalized, it will be difficult for Prime Ministers to make unelected appointments. 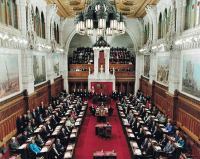 Senate reform may become a key aspect of this Prime Minister’s legacy, despite the fact that it began with the less than ideal appointment of Michael Fortier. I’d just like to let everyone in on another reason why I am a conservative. I am a strong believer in senate reform. 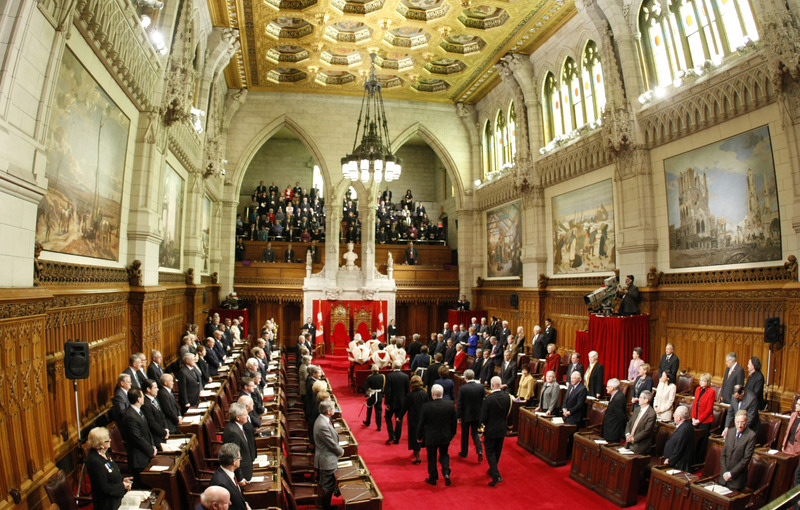 This upper house of Canadian government has power over the lower House of Commons to reject and modify its legislation. This might seem like a reasonable additional level of scrutiny for the laws of the land yet it is wholly unreasonable because this upper house is entirely unelected. Furthermore, a lot of legislation isn’t rejected; the senate is most often merely a big rubber stamp. It is the prime minister’s duty to appoint senators and thus senators are effectively the puppets of the prime minister and his predecessors. Worse, we’ve had one party in power for about 75 of the last 100 years: the Liberal party. So, the Liberal prime minister gets to appoint his Liberal friends to keep the elected house of Commons/Commoners in check. Thus the big red rubber stamp (a stamp without credibility) approves the laws determined by elected official of the House of Commons. Over the years, there have also been scandals regarding the attendance of these non-elected legislative members of senate. However, the government of Canada reassures us that senators get penalized $250 per absent day that the senate was sitting. In the year 2000, the senators sat for 61 days. So, if a senator had decided to take the year off his pay would have been docked $15,250. This figure may be large to some but consider that senators get paid $114,200. This leaves our senator with a cool $98,950 (assuming he didn’t attend a single sitting). The latest senator was appointed by Jean Chrétien on the day before he handed over control to Paul Martin. The new senator is Jim Munson, a former CTV reporter who worked for Jean Chrétien for a mere 16 months before getting the $114,200/year job guarenteen for the next 18 years. Roger Smith should be so lucky. We need senate reform. We should elect our senators so that they are accountable to the people. Election would lend credibility to these parliamentarians and it would allow a true check on government. Each province should elect an equal number of senators. In our confederacy, each region is equally important. Western alienation has been a key complaint against the Liberal government and thus equal representation of each province would do wonders to eliminate this neglect of the West. Currently, Paul Martin gets input from the provinces in a non-binding annual meeting of premiers… at football games, no less. Here the premiers can complain to Paul Martin and he has the choice of listening or ignoring these leaders. Forget this meeting of Canada’s premiers over beer, wings and football. Send elected senators to Ottawa to give each province equal influence. Finally, the senate should be effective. The senate will attain this effectiveness if it is not merely the PM’s rubber stamp on legislation.